I received this Illamasqua Body Electrics Illumine Oil from the lovely Holly Arabella a week a go as she no longer wanted it. I WAS SO HAPPY. I'd spotted this a few weeks prior and wanted this so bad. First of all, how gorgeous does this look? The body oil is part of the Illamasqua Body Electrics collection, featuring more gorgeous eyeshadows and stunning nail varnishes. For some reason I expected it to be slightly bigger, but in fact its the size and probably volume of a foundation. But that aside, it still looks gorgeous. Sitting on my shelf it looks so pretty, the golden liquid shimmering and catching the light. I just can't get over how beautiful this looks. I almost can't trust my self holding it, imagine if it broke all over my floor and the gorgeous magical liquid got absorbed into my carpet! The thought kills me! How gorgeous does this look? Amongst all the golden and bronze shimmers I spot some silver and violet iridescent specs. It's just simply breathtaking. Another thing you notice straight away is it's tropical scent. This oil has a gorgeous passion fruit smell to it, and once rubbed into the skin I can smell a soft scent of passion fruit. 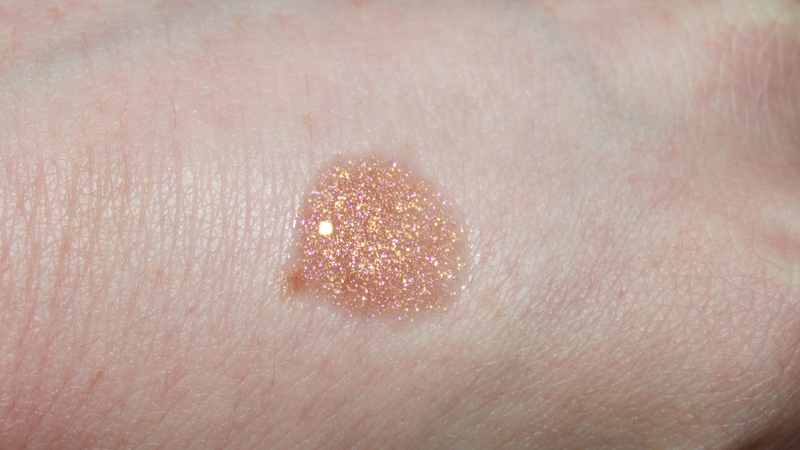 I'm a massive fan of body shimmer, and this is most definitely in my top 3. Once spread over my decollatage, the oil is immediately soaked up leaving no grease feeling - Just gorgeous shimmer! This photo below doesn't do it any justice, this body oil really does give some amazing shine. I love using this, and I love the way it looks on my shelf, catching the light so delicately. Because of how expensive it is, I don't want to use much of it! A great point of this product is it's life, it lasts 2 years! Such a bonus for me. You can grab this bottle of gorgeous shimmer in two colours, Volt and Pulse. The one I have here is in Pulse. You can get it from Debenhams for £32. As I said, a little to expensive for body shimmer. But there's something very enticing about it - But then again all Illamasqua products give me that impression! Thanks for reading, and I hope you enjoyed. Let me know what you think of it too!